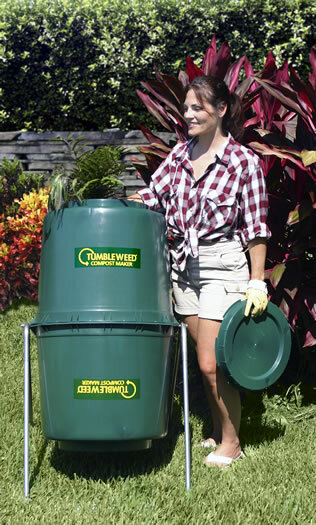 Tumbling compost bins such as the Tumbleweed are your traditional compost tumblers. Some these composters only have space at the top, while others (such as the tumbleweed) have spaces at the top and bottom to load in your material – leaves, grass, banana peels, apples, carrots – you get the picture. The nice thing about a bin like this is that all you have to do is just load the material in, seal the lid, and give it a few spins. That’s it. The overall compost time will be sped up and you will be on the path to righteous compost quicker than you can imagine. These bins are usually elevated off the ground as well, which is a totally nice feature. By resting off the ground, you don’t have to worry about animals getting into your compost and bringing havoc upon your life and lawn. Photo found on Flickr.com courtesy of Estacey. 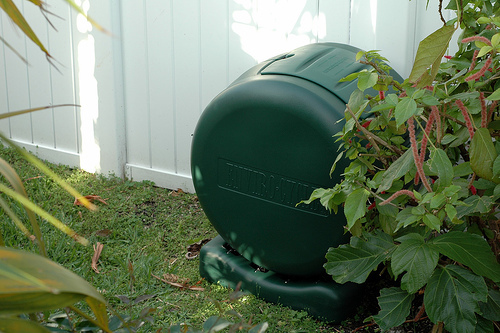 A spinning composter, such as the Envirocycle is another excellent way to get your compost on. This style composter is circular and spins on metal rods, so there’s an air of fun to it, and it’s not that bulky. As mentioned in the product review, the Envirocycle in particular is nice because you can just roll it to other areas of the lawn, and it produces up to 5 gallons of compost tea. Quite the nutritious, tasty treat for your plants, vegetables, fruits, and lawn. Because of the spinning nature of this style of composters, compost is also produced quickly – typically in a range of 3-6 weeks. In just a short time, you will be ready for some finely composted material for your gardening needs. These bins come in handy because they have two chambers. While one of the chambers is being filled with organic material, the other chamber can be used to mature the material into rich compost. When your material is ready to compost, you can empty out one cycle of the bin and then begin anew. This is perfect, because essentially there is a continual cycle of compost. In addition, these bins often sit off the ground, and are good if you are looking to resist attack from rodents, animals, or various other pests. Photo found on Flickr.com courtesy of Madness Rivera. Pugs not intended for use in composter – just garden materials. Thank you. There are so many outstanding benefits associated with the Envirocycle Composter. This compost bin is basically a spinning drum that rotates on a base with eight rollers. Therefore, to turn your compost, all you have to do is just spin the thing around. It stays in place, is not bulky, and is super easy to use. It also produces compost quickly – as you can have compost ready to go in four to six weeks! Another really outstanding feature of this compost bin is how it can create compost tea with ease. Compost tea is liquid produced by compost, and it’s chock full of nutrients. Because of this, compost tea becomes a fantastic way to spice up the look and feel of everything in your lawn and garden – be it plants, flowers, or even vegetables! The base of the tumbler can collect up to 5 gallons of compost tea! If for some reason you just really aren’t interested in compost tea, don’t worry – you can plug it to where the liquid/nutrients just seep into the ground. So the composter is great for compost to tea and spins with ease to tumble the compost around – are there any other benefits? Sure. Take the spinning, for example. Since the compost bin spins on the rollers and the bin can roll, if you want to transport the bin to another area of the lawn to use, just pop it off the rollers and roll it over there with ease! This is a function many other compost bins do not have- as if you are to need the compost, you have to shovel it into a wheelbarrow, then transport it across the lawn. By simply rolling this bin from spot to spot, you are easily eliminating about 15-20 minutes of work from your schedule – that’s more time to relax, do some additional gardening, catch the pre-game show before the Stars beat the Red Wings – you name it! As far as dimensions go, this composter has a height of 29 3/4 inches, a length of 26 1/2 inches, and a depth of 21 inches. It holds approximately 53 gallons (7 cubic feet) of compost – that’s a lot for you to use for your lawn, garden, or both! 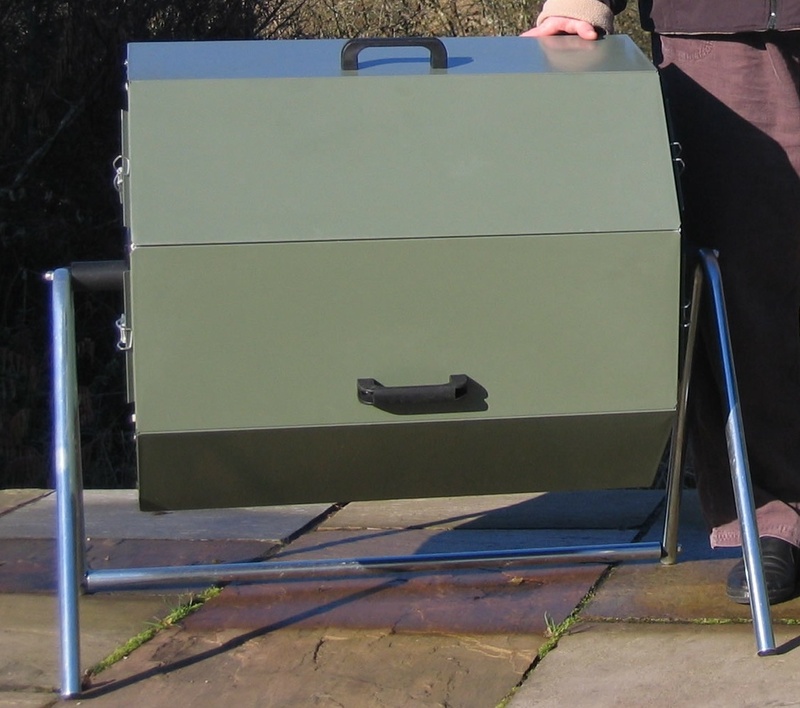 We have also found this great product video on the web about this composter! Here you can see it firsthand! Compost Maker: Are compost activators necessary? What is a compost activator? It is often also referred to as compost starter, composter maker or compost accelerator, and is an organic substance that will basically speed up the compost time of your materials in the bin. It aids in the breakdown process simply by speeding it up by using a combination of pH balances, energy sources, and microorganisms. Compost Accelerator is not entirely necessary to your compost pile. This is because the natural breakdown of materials will occur just as it would in nature. Additionally, sometimes some freshly made compost or nutrient rich soil mixed in with your organic material can help start the process as well. However, the fact remains that compost starter really lives up to its name – it “jump starts” your compost heap and gets everything working in such a way that you will be on the highway to an excellent compost pile in no time. So if you like to get a quick start on things, consider adding some compost maker into the mix.